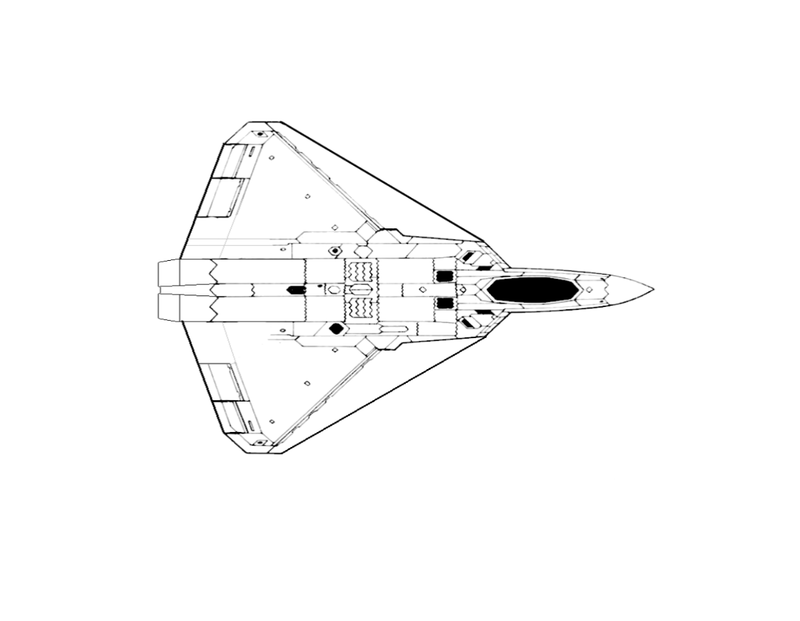 The X-44 Manta was a concept aircraft by Lockheed martin to demonstrate the feasibility for a thrust vectored fighter with better range and maneuverability than the F-22. The aircraft was essentially an F22 with the vertical and horizontal stabilizers removed and a extended delta wing. There is not much information on this aircraft and as far as I can tell there is only one concept photo of it. The project was ended in 2000. So due to the fact there is only one photo available, designing this should be interesting. What I have done so far: I found a plan photo of the F-22, I then edited it to resemble the X-44 by removing horizontal and vertical stabilizers and extending the wing up to the intakes. So now I have something to build off of I am going to build it with Ft Style Airfoils on the wings and just use a foam box for the fuselage, the control will be with elevons and it seems like a fairly simple build. I dont know when I can do some actual building work on this I will hopefully start it in early November. I can't wait to see if you can get this to actually fly due to the lack of a vertical stabilizer, good luck with the build! Yeah, gyros might be in order, if worst coms to worst I will put a clear plastic fin on top, I am hoping I can build it sort of like a flying wing with a nose, idk though. I think that the EDF's are too close together to have any leverage on the model's yaw axis, especially in a spin. Maybe you could " cheat" a little by adding very small, clear, vertical surfaces on the wingtips and where the normal vertical stabilizers would go. I considered that. I think I will try it with little V-stabs on the wings and see how stable it is. this will be a challenge though. To be honest I did not know if thrust vectoring could provide yaw stability, I could definitely try it. thanks. I have been following your B-17 project, very excited to see it built. This is going to be very interesting to see perform! As another idea for yaw stability, split trim tabs on the outer sections of the wing to create a source of drag well behind the CG might work well too - or you could perhaps make them split ailerons on the outboard wings where they move together when in elevon mode, and when rudder input it added the aileron splits open to provide extra drag on that side of the wing. I saw a video recently of someone showing open TX radio programming for that. Lemme know if you want me to dig up the link. Definitely! That combined with thrust vectoring should provide adequate control. I have several ideas on what to do with this but I am not going to do anything immediately, I still have to figure out the best way I should power this. Question for @Mid7night is ducting an EDF necessary for maximum thrust? Also when ducting does it have to be circular or can I make a box out of foamboard? Yes, some amount of ducting is necessary to get the max performance out of an EDF. I usually start by making my exhaust nozzle area 85% of the Fan Swept Area (FSA). The exhaust can be square. There are some inefficiencies associated with the shape transition, but at our scale and pressures it's not a big concern. More important is that the exhaust path is clear and clean and smooth. So i showed this to a aerospace engineer i know who has been building jets for over 20 years and his response to it was "Unless you have B-2 level stability computers, that will never fly". Guess that means i am going to have to cheat a bit. I guess i will try clear winglets and if necessary, canards. I am planning to do a lot of work on this over thanksgiving so there will hopefully be a update then. What about splitting the outer control surfaces to do the yaw control. I considered that but that would be a challenging setup to achieve with the 3 servo budget i have right now, i think clear winglets are the way to go with this just for simplicity sake. Its been a while since i have been working on this, it got buried in a bunch of other things i had to do and then Christmas happened. However i think i am almost ready to do a prototype one. The build itself should be simple. just two wings and a fuselage. The more challenging part is figuring out how to make this obey the laws of aerodynamics. I have been doing a bunch of reading and i think what i will do is build it with two small, clear winglets. that combined with thrust vectoring for yaw control should hopefully allow me to maintain control over the jet.